Nicolás Correa Service, S.A., offers customers the possibility to update the technology of their used milling-machines once, over time, the technological features of the machines have been rendered obsolete. This was recently the case for a French customer, who decided to have his high-speed 1998 CORREA EURO2000 milling machine retrofitted in order to bring it into line with the latest standards. The CORREA EURO2000 gantry milling machine was the first high-speed machining model to be manufactured by NICOLÁS CORREA S.A. It is noted for its high-speed built-in motor spindle which allows this milling machine to reach 10,000 RPM, offering high performance as well as exceptional precision. With a travel of 2,000 mm on its X axis, 1,250 mm on its Y axis and 650 mm on its Z axis, this machine features a 24 -pocket automatic tool changer, a chip conveyor and high pressure coolant through the spindle. The French company DEVILLÉ ASC purchased this milling machine brand-new back in 1998 and, since then, it has been used in the manufacture of spare parts for tools of production in the field of automotive components subject to safety standards (safety belt units, airbag parts, etc.). After almost two decades in operation, this French customer took the decision to extend the useful life and enhance the original features of the machine through a full retrofit by NC Service. Before commencing this complete retrofitting work, NC Service held prior meetings with, and made visits to the customer, in order to agree on all the details of the operations to be performed. All our customer´s requirements were studied and agreed on, until we had finally defined all the work to be performed and parts to be replaced. This allowed us to ensure that the retrofit was in line with our customer´s machining requirements and that the work could be performed on dates that suited our customer. Therefore, in September 2017, our technicians travelled to our customer´s plant in order to prepare the milling machine for transport to NC Service. Once at our facilities, the first step was to dismount all the structural parts in order to replace, inspect or repair them, depending on each particular case. The most noteworthy part of this process was our customer´s demand to replace the original Heidenhain TNC-426 control in the milling machine with a more updated version, finally opting for the installation of a new Heidenhain iTNC-530. It was also agreed to replace all the linear guides on all three axes of the milling machine with brand-new ones. A collimator was used to check for the correct installation of these new guides, as shown in the video below. At the end of December 2017, NC Service installed and commissioned the milling machine at the facilities of DEVILLÉ ASC, where the protocols for the geometry and precision of the milling machine were repeated. 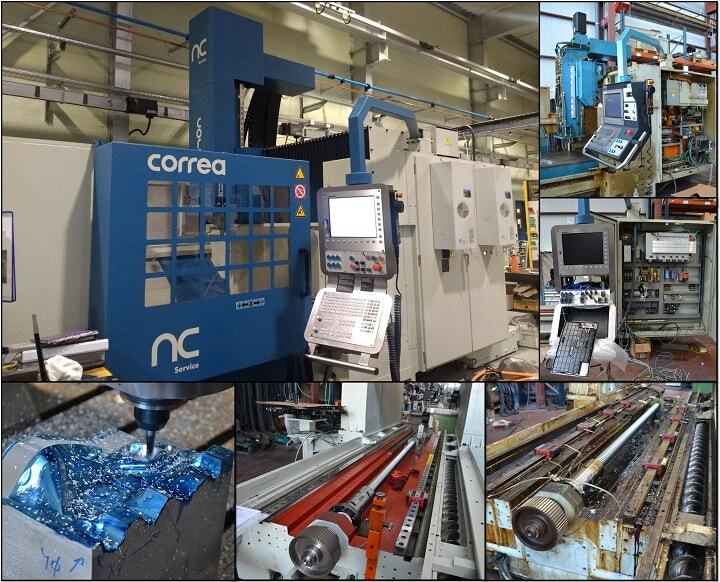 Following the work to retrofit and update the technology of this CORREA EURO2000 milling machine, the company has not only managed to extend the useful life of the machine, but has also increased its production capacity and, in particular, the degree of precision of its machining work.